Founded in 1886, Ladbrokes is now an internationally recognised company, synonymous with gambling and gaming. Today the company is one of the world’s largest fixed-odds betting companies and a household name. Although Ladbrokes started off as a high-street bookmaker, they have since branched out to provide numerous gambling opportunities and experiences to the everyday punter. 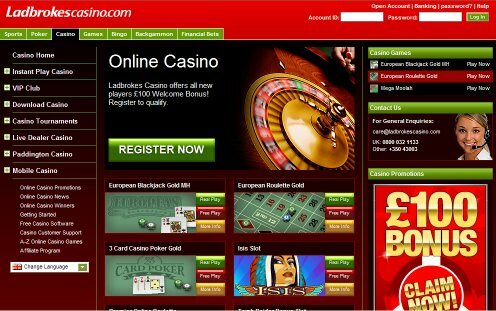 Adapting to the ever-expanding gambling market, Ladbrokes launched the online casino site in 2001, continuing to be at the cutting edge of the gambling industry. Ladbrokes now has over 197,000 active players (based on 2009 figures) and continues to acquire more through creative television advertising. Players who don’t wish to download the casino software are able to play online in the Instant Play Casino, which features over 290 games. Players looking for a more realistic casino experience can choose to play in the Live Casino, with video streaming of live table games ready and waiting. Or for players who rarely have the luxury of time, the Mobile Casino is the better option. In terms of game variety, Ladbrokes Casino has an astounding amount to offer. We have all the usual games you’d expect to find such as roulette and blackjack, but we also present numerous variations of these typical favourites such as American, French and European Roulette and Spanish, Atlantic City and Vegas Strip Blackjack. Ladbrokescasino.com also boasts one of the most extensive ranges of 3 and 5 reel slots, with sought after releases such as Tomb Raider Secret of the Sword and classics like Hitman. Also adding to the slots offering, are a range of progressive jackpot slots, such as Mega Moolah, with achievable wins starting at an impressive £1,000,000. In total, there are over 460 games available across the instant play and download casino, with around 5 new games being added every month. With most games available for free or real, there’s something to suit everyone. Unlike the majority of online casinos, Ladbrokes Casino consistently boasts one of the highest payout percentages, a huge 97.11% (based on payouts over the 2009 period). Microgaming powers 120 of the world’s most profitable casino sites, all of which have the same game portfolio and content, including Ladbrokescasino.com. 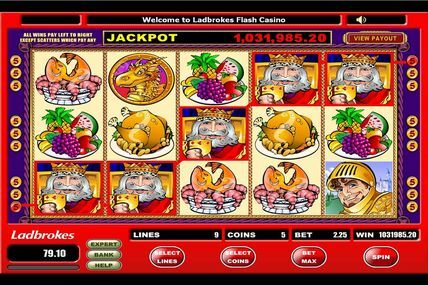 It is thanks to this software that Ladbrokes Casino are able to provide such innovative, reliable gaming to the public. For players who choose to download the software, the 4.4mb file is smaller than those provided by many competitor sites, therefore taking up less room and time to download. Ladbrokes Casino also has superior graphics and sound effects to enhance the gaming experience. Play is available in full screen mode with customisable settings to suit individual tastes. The games all run smoothly and loading times are minimal. A £50 no deposit bonus will be offered to all new players from the 26th January – 18th April 2010. This will be promoted through the TV campaign and all supporting online activity. The offer will makes Ladbrokes the most competitive online casino in the market place. They also offers a generous 100% deposit match for all new players on their first deposit between £5 and £100. Players must play through their deposit once before they can claim and a total of 10 times to remove the bonus. For existing players, Ladbrokes Casino run daily, weekly and monthly promotions presenting chances to win prizes. Rewards offered include free spins, free chips, scratch cards, holidays and cash. High staking customers can also look forward to joining the VIP Club, which allows players to claim additional bonuses and rewards. Benefit from the VIP lounge, VIP rewards, VIP events, VIP promotions and exclusive VIP contact from your very own VIP loyalty manager. The most recent winner was Stefan from South London, who beat over 8,000 players across the Microgaming network to become the first online slot tournament millionaire. Stefan pocketed an incredible €1,000,000 from a €2 qualifying tournament this November. Another of their recent millionaires was Mr S from the North East of England, who won £1,031,985.20 last January on their progressive jackpot slot, King Cashalot. Other notable wins happen on a weekly basis and can be seen in our online casino winners’ table, available at Ladbrokescasino.com. Ladbrokescasino.com currently operates in 18 territories, all of which have their own language site. These include; English, Spanish, Portuguese, Greek, Polish, Norwegian, Finnish, Danish, Swedish, Thai, Chinese (simplified), Chinese (traditional), Russian, Romanian, Slovakian, Slovenian, Bulgarian and Croatian. Deposits and withdrawals are simple and fast. We offer one of the widest ranges of payment methods to deposit at Ladbrokescasino.com (Delta, Maestro, Switch, Solo, Visa, MasterCard) plus Money booker, Neteller, UKash, PayPal, eNETS for Singaporeans, Cashier Cheques, Money Orders, Western Union QuickPay, Bankers Drafts, wire transfers, even Personal Cheques are also accepted. Minimum deposit is £5 or the currency equivalent and the maximum daily withdrawal is £2,000. To withdraw more just contact the Ladbrokes customer service team. Withdrawals take approximately 3-5 days to reach your account if using a credit / debit card and as little as 6 hours if using paypal. In order to protect your privacy and give maximum security, Ladbrokescasino.com uses firewall technology used by both the military and government to apply strong encryption. In terms of support there are different sections to enable customers to find help as quickly as possible. For anything that isn’t listed within the self-help section, there are other options such as live chat, email and a 24-hour customer service helpline available across the 18 languages that the site has to offer.